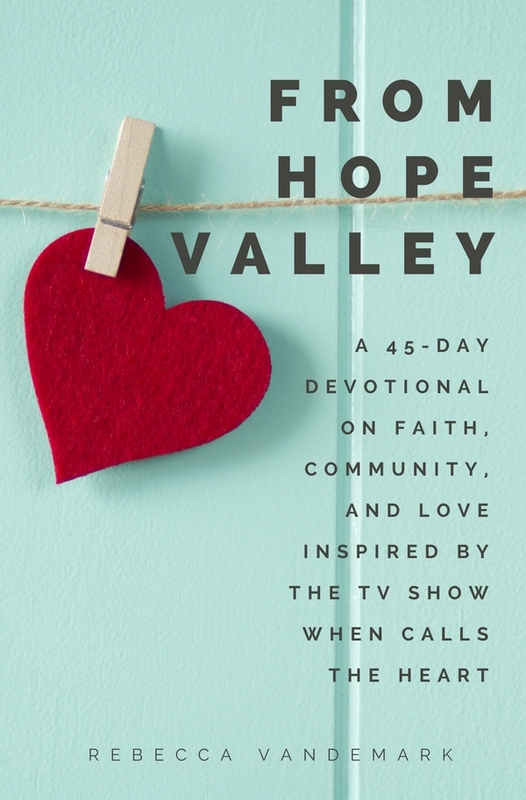 I am so excited to share my new book, "From Hope Valley: A 45-day devotional on faith, community, and love inspired by the TV show When Calls the Heart" will be released on February 10th, 2017!! This book, "From Hope Valley", is the first and only devotional book inspired by the show, "When Calls the Heart" from Hallmark. This beautiful show is extremely well acted, directed, and designed and is a show that is devoted to the themes of faith, community, and love. Community that transcends the TV show and has a personal facebook page of people sharing their hopes, dreams, losses and love, and who are met with a listening and supportive ear. Faith that despite the tragedies in our world there can be goodness found in difficult situations, in the mercy of others and in the hope for better days ahead. Love for fellow mankind and neighbors that are hurting and broken and for anyone that we encounter in our lives. These themes resound in the TV story lines from When Calls the Heart and are woven throughout this devotional. Our backgrounds, our personal beliefs, and our lives might look extremely different but the common themes of community, faith, and love transcends all of the differences.These themes as well as topics like kindness, gratitude, courage, forgiveness and others will encourage and inspire each person who reads it through the short daily devotionals while reminiscing about a favorite When Calls the Heart scene. I started writing this specific book in the summer of 2015 as I was struggling with my health and needed the things that I watched on TV to hold encouragement and inspiration. Honestly it was hard to find so I found myself re-watching old episodes of When Calls the Heart. Like many others, I found that this beautiful show was a rich encouragement in my life and took me back to the deepest part of my heart and I was inspired to write a devotional based off of this! When I had the beautiful opportunity to visit the set last week I thought my heart would burst at thinking of this book and today I am so excited to announce it! Most of all above anything else I hope that this short and sweet devotional book will inspire hope and encouragement in your life. "From Hope Valley" will be released on February 10th, 2017! Thank you so much for your sweet support in this exciting new project! P.S. If you would like to keep up with updates specific to this book please follow along at the From Hope Valley Instagram page which you can find HERE! Also- I am going to be announcing the opportunity to be apart of the book launch team in a couple of weeks! If you would like to be apart of this (you don't have to be a blogger!) please leave a comment below with your contact information or send me an email and I will give you more information! Thank you!! This is so exciting!!! When Calls the Heart is one of my favorite shows!! Thank you so much Bailey!! Your words of encouragement are such a GIFT. Thank you!!! I hope that you are having a WONDERFUL weekend!! Cool! I've had When Calls The Heart on my 'to watch' list for a while now, at least to check out the first few episodes because I like supporting shows that are filmed in Canada. I haven't gotten around to it yet but maybe over Christmas I'll give it a chance. Congratulations on your book! Thanks so much for stopping by Donna!! I definitely recommend the show (and Canada is a beautiful place for taping!) and hope that you enjoy it! :) I am not sure if you have the Hallmark station or not but the new season starts on Christmas Day with a movie that night if you are interested! Thanks again for the sweet words of encouragement about this project! I am truly excited about this book!! That is so sweet of you! It has been very busy but I am loving it and I love writing and the Lord has been so good with different book contracts and giving me the strength to do this in the midst of treatment! This sweet devotional has a special place in my heart and I hope and pray it will be an encouragement! Thanks so much for stopping by and leaving such a sweet and encouraging comment! I hope that you are having a wonderful week so far! Thank you again for your interest in my writings! HOLL and LANE Community + a giveaway!